A Center of Non Violence, Democracy and Human Rights in a World of Conflict. WHAT IS REFUGIO? REFUGIO is a 45 acre refuge located outside Harlingen, Texas, USA. It was opened in 1986, to offer a place of refuge in the United States for political refugees from Central America. Now, refugees from all countries of the world are welcome. REFUGIO is also a refuge for a wide variety of wildlife, who find a safe and friendly environment. 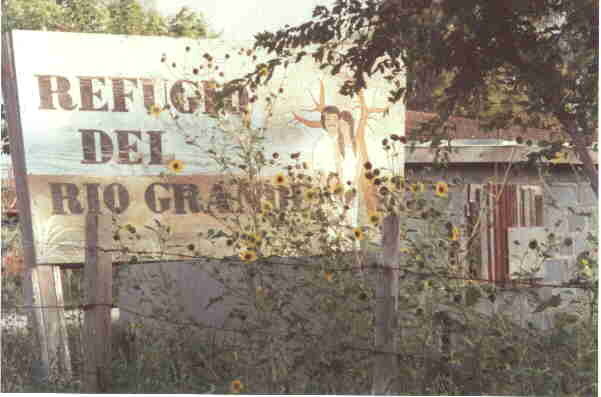 At REFUGIO, basic needs of housing, clothing and food are met. Those looking for asylum because of repression or oppression can find peace as they work through the process of their legal case, living with friends who work in solidarity for justice and peace in a small self governing community. A sense of balance is sought between nature and humanity as we live and work together. WHAT HAPPENS IN REFUGIO? Refugees and volunteers at REFUGIO work the land, growing vegetables and fruits by traditional means for the consumption of the camp. It is hoped that at some point, the fruits and vegetables may be sold to help support the work of REFUGIO. There are also horses, a small herd of cattle, chickens, ducks, emus, geese, and llamas. A resaca and adjacent wetlands which are home to migratory and native birds, fish and other water animals also grace the grounds and provide a place of education and training for those interested in the environment. Refugees stay an average of two months. Everyday, everyone in the camp works for the good of the camp from 8 a.m. until noon. The afternoons are spent taking care of personal needs: doing laundry, taking classes in English, legal work, working on crafts, etc. The evenings are free. WHO MAKES UP THE STAFF? There are two unpaid workers: a coordinator and a lawyer. Numerous volunteers, who come from all parts of the country and the world assist with the daily activities and work of the camp. Volunteers include members of religious communities, pastors, students, lay persons, friends and others with interest in what we are doing. Volunteers work with the refugees and the environment and use their skills, talents and gifts to empower the refugees to develop their potential in this country. Volunteers are always needed. A permanent community of persons interested in living in a refuge like REFUGIO is also being developed. 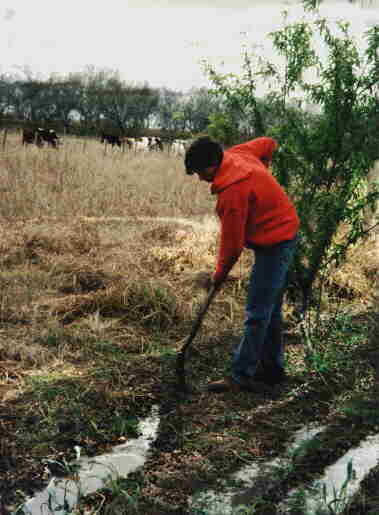 Permanent community members would work at the camp or in outside employment while helping to develop the community and the environment at REFUGIO. HOW IS THE WORK SUPPORTED? Support for the work of REFUGIO is dependent on friends and supporters from across the country. It also comes from the work of the law office. REFUGIO does not receive money from the government. All contributions are tax deductible. HOW CAN YOU HELP? REFUGIO operates within the boundaries of the political and legal realities of our times. One way to help is to be active politically encouraging our Congresspersons from the United States to vote with conscience and to deal with justice those persons who flee to this country because of repression and oppression. Your financial contributions are always welcome as are items such as household supplies, shoes and boots, woodworking and other tools, lawnmowers, seeds, saplings, books of all kinds (in English and Spanish), etc. We need volunteers who are able to stay at REFUGIO for two or three months at a time, or more, who speak Spanish at an intermediate level or have a desire to learn. Persons with particular skills in environmental sciences, construction, agriculture, animal care, woodworking and crafts, computers, paralegals and other areas are necessary as we build the community. Your prayers are always needed for the important work of REFUGIO. Pray for the refugees and for those who work with them and for them. Wood Projects from Refugio del Rio Grande: An explanation of the wood projects available from our wood shop.